Review&colon; Praise for the All the Wrong Questions series: "A Pink Panther-esque page turner...exceptionally literary and entirely singular. Characterized by linguistic playfulness and an appreciation for the archaic, "Who Could That Be at This Hour?" 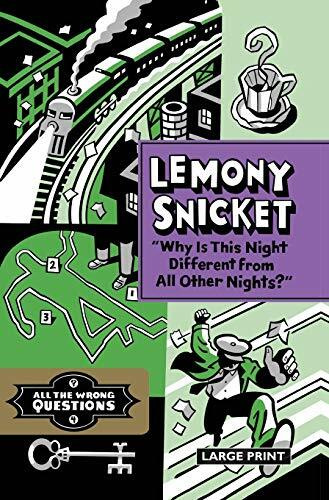 is frequently laugh-out-loud hilarious...illustrations by celebrated cartoonist Seth only add to the throwback gumshoe vibe of this outrageous, long-overdue, middle-grade follow-up series from a truly beloved narrator." ""Los Angeles Times"""
"Please, it's Lemony Snicket. Enough said." ""Booklist"""
"There's no stopping Snicket!" ""Booklist"""
6. Why Is This Night Different from All Other Nights? 8. Why Is This Night Different from All Other Nights?"